Editor’s note: Patagonia ambassadors Steve House and Marko Prezelj are back at Makalu. 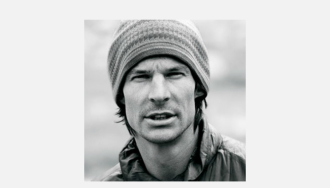 Longtime Cleanest Line readers will recall their previous attempt to climb Makalu’s West Face in 2008 with Vince Anderson, and Steve’s subsequent trip in 2009 when he made an emergency solo decent from 21,300 ft. with High Altitude Pulmonary Edema. Similar to the previous trips, Steve will be calling in with reports from his sat phone. Today, we’re happy to share his first call from this trip, and some background on the expedition. Marko Prezelj is organizing an expedition to Makalu this Spring and I will be joining him as will Rok Blagus (SLO), Luka Lindic (SLO), Boris Lorencic (SLO), and Dr. Scott Boughton (USA). The average age of Marko and I will be 43.5. The average age of the other five climbers; 24.6 years. Dr. Boughton will have ample opportunity to explore and trek, but will also endeavor to keep us healthy and light-hearted. I’m confident that he can do both. Our objectives for this expedition are numerous and diverse. First among them is not to be tied down by the expectations of others. To that end we are funding the expedition through the Slovenian Alpine Association and the balance coming out of our own pockets. We will invest a lot of ourselves, in many ways, and in return we will retain full ownership of the process and the outcome. A fair trade for certain. In climbing terms our plan is to attempt new routes or first alpine-style ascents. To the alpine-style-end we might try the West Pillar (French, 1971). For new routes we need not look further than the miles and miles of unexplored terrain on the south and west faces of the mountain. If all goes right, we won’t step foot on the normal route until we stand on Makalu’s summit to descend. This will be Marko’s second expedition to Makalu and his 25th to the Himalaya. For me personally this will be my third trip to Makalu since September 2008. While I certainly hold ambitions to climb well on this trip, the more interesting aspect of the expedition is to share it with younger and markedly less experienced climbers. The young-pups will learn a few tricks from us old-dogs, but I’m sure that Marko and I will be more than repaid in inspiration as well as quality experience. This group is strong; every individual lively, talented, and motivated. As a team we have decided that there will be no expedition website. We will carry a sat-phone to BC to stay in touch with loved ones, use for emergencies, and access weather forecasts. Outside of that we’ll stay completely focused on our surroundings, our objectives, and the important, immediate relationships between us. For me personally, it will be a good test of my recovery post-Mount-Temple. But I go into this trip truly light on expectations. I know, without having to search for that sensation, that we will focus on process, climb well, and with a little luck we will get into enough trouble to have a great adventure.